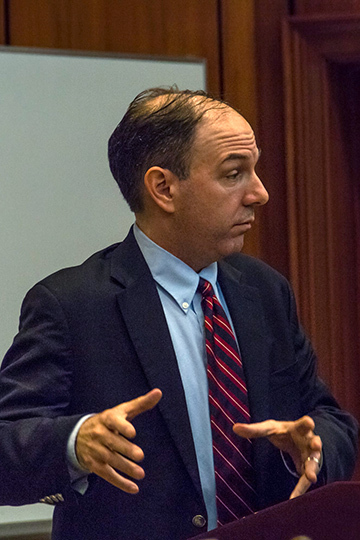 Samford University’s Department of Journalism and Mass Communication hosted Pulitzer Prize–winning journalist Brad Schrade for the annual Timothy Sumner Robinson Forum March 1. Schrade is an investigative reporter for the Atlanta Journal-Constitution and won a Pulitzer Prize in 2013 while with the Minneapolis Star Tribune. “We’re at a moment again where popular culture has deemed investigative work important and even pretty cool,” Schrade said. He used the award-winning films Spotlight and All the President’s Men to illustrate this point. The 2016 Academy Award winner Spotlight, he said, comes at an important moment in the profession of journalism. The field is currently struggling to figure out how to sustain newspapers and other printed media, and this film might inspire a new generation of journalists. Schrade shared two investigative reports that he worked on in recent years. Most recently, he covered police shootings in Georgia, particularly in Atlanta. The project started with the question “How many people in Georgia have been fatally shot by police?” Nobody could answer this question, he said, and no data was available relating to the question. Because of this, Schrade and fellow journalists spent thousands of hours doing research and found that in half of cases, the person fatally shot was either unarmed or shot in the back. Schrade’s work on this project caused one case to be reopened by the district attorney and uncovered collusion. It also forced a police department to break the code of silence that kept these cases in the shadows for years. As a result of the journalists’ work, policing within the state of Georgia improved. Most stories start small, Schrade noted. Journalists constantly have to ask more questions and overcome significant obstacles. After a daycare center in Minneapolis was shut down for numerous violations, journalists began to ask why it took so long for such a facility to be closed. Schrade’s research revealed a system that harmed children. However, he and his team struggled to find families who had lost children who were willing to talk. Finally, Schrade received a call from a father whose in-home caretaker had left their 3-month-old baby face down, suffocating it. The caretaker had also lied about carrying insurance. This one piece of information changed the whole story, Schrade said. The result from this investigative reporting was a decreased number of deaths. No longer was one child dying per month after being placed in an unsafe sleeping situation. “Investigative reporting can have a huge impact,” Schrade said. It can literally save lives. Schrade encouraged students to follow their passions. There are opportunities available to them that were not available years ago. The Timothy Sumner Robinson Forum is named for a 1965 Samford alumnus who had a distinguished career in journalism before his untimely death in 2003. Among his professional achievements, Robinson was part of the editorial staff at The Washington Post that was involved in the investigative reporting of the Watergate scandal in the 1970s. Aly Hathcock is a journalism and communication major and a news and feature writer in the Office of Marketing and Communication.